Chatman: A Computer Friend for the Whole Family! Add Fun to Playtime with B Kids Toys! New Feature: In the Spotlight! Krona Cookware Giveaway from The Prepared Pantry! The Grand Event Cash Giveaway Needs Bloggers! I recently discovered Winchell Mountain Coffee, and it is SO good! They’re very selective about which beans they use in their coffees, and their products are vacuum-packed into one-way goglio valve bags for premium freshness! I can really taste the difference when I drink Winchell Mountain Coffee. Most other coffees seem “blah” in comparison. My husband and I have especially enjoyed their Wide Awake Coffee in the mornings. The package describes it as “a bold and zesty premium blend,” and that is right on target! It has a very rich and robust flavor that really helps us get started in the morning. If you like your coffee a little milder, Winchell Mountain Coffee has something for you, too. Their Beach Blend Coffee is “a mellow moca java” that still tastes amazing but isn’t quite as bold as the Wide Awake. Or you may want to try their Country Morning Coffee, described as a “leisurely breakfast blend.” We like to have that one on the weekends when we have more time to enjoy our morning coffee. You can easily recognize Winchell Mountain Coffee because many of their packages are decorated by one of my all-time favorite cartoonists, Sandra Boynton. I adore her animal drawings, like the bikini-clad pig on the Beach Blend package or the coffee-drinking cow on the Country Morning Coffee. 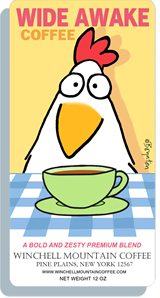 Waking up with Sandra Boynton’s humor and Winchell Mountain Coffee is the perfect combination! Now, just in time for Valentine’s Day, Winchell Mountain Coffee has come out with a special limited edition flavor of coffee called “Valentine’s Day: An Affectionate Blend”! What an awesome gift idea for the coffee lover in your life! 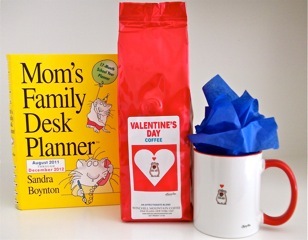 The bright red package, Sandra Boynton’s art, and the delicious coffee inside are sure to put a smile on anyone’s face. I hope you’ll visit Winchell Mountain Coffee online and check out all of their wonderful varieties of coffee. And, yes, if you prefer your coffee decaffeinated, they have some coffees for you, too! Their coffees are available as whole beans or ground. If you like really great-tasting coffees, I think you’re going to love Winchell Mountain Coffee. CONTEST CLOSED. Congratulations to the winner: Terra H.! I think hubby would like the AllNighter Coffee. I like the packages on all of them! I would like to try the Boynton Collection Bob's Diner coffee. The Beach Blend sounds heavenly! i want to try the beach blend. The Decaf Mexican Viennese looks good. I'd like to try Birthday Blend. I'd like to try the Not A Morning Person blend. Being a serious coffee drinker, I think I'd be interested in trying their Serious Coffee. I would like to try Not a Morning Person. I'd like to try Country Morning! Not a morning person sounds good. The Country Morning looks good!! I'd like to try the Country Morning Blend or The Official Gravity Feed Blend. I would love to try the All Nighter Coffee. I would love to try Birthday Blend. Perfect Harmony sounds good to me! Their Perfect Harmony sounds perfect for me-not too strong. I'd love to try Bob's Diner! Nice giveaway. Thanks. I'd like to try the Mountain Blend (though I was sorely tempted to go with Louie since he looked so cute on the bag). I'd love to try their Guatemalan single origin coffee. I'd love to try the Beach Blend. I think the Country Morning blend sounds wonderful! I'd like to tray "Up and at ‘em" in a Coffee beer recipe. I would love to try the all Nighter Coffee! I'd like to try the Country Morning blend. Thanks. I'd like to try the beach blend :) Thanks for hosting! The All Nighter sounds good! I'd like to try the Overdrive Espresso. not a morning person blend! I'd like to try the perfect harmony blend! I go for this one - Not a Morning Person. I would like to try the Official Gravity Feed. I would like to try Sudden Inspiration. I'd try the Birthday Blend. I would love to try county morning. I don't like coffee, but my husband would love the Not A Morning Person blend. I'd like to try the yrgacheffe. Thanks for the giveaway. The Not a Morning Person blend fits me to a t.
I'd love to try Not a Morning Person! 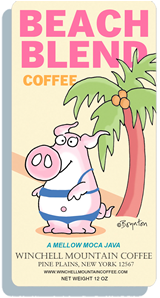 Beach Blend, just cause that pig in the bikini is so darned cute. I want to try the Birthday Blend. Organic Fair Trade Peruvian is one I would like to try. I'd love to try the Overdrive Espresso. Birthday Blend is my coffee of choice! I'd like to try the Evening Coffee.